Video Recipe - A real autumn and winter classic. You have to start early, but most of the time spent is only simmering, and it takes care of itself. 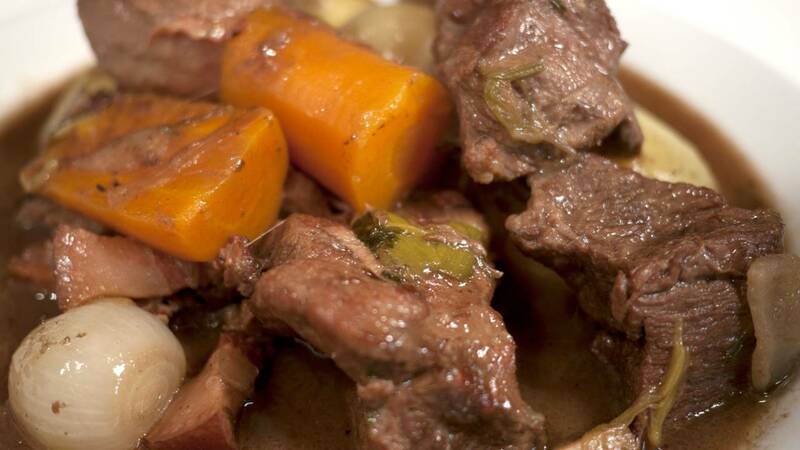 A stew is good basic recipe to have in your arsenal for all those "cheap" beef cuts. It may look complicated, and has quite a list of ingredients, but you use a lot of classic techniques, so this is one of those dishes you become a better cook by, and it is easy to vary. 1.5 kg (3 lbs) coarse beef (loin, shoulder, osso buco, etc.). Cut the bacon into ½ to 1 cm (1/4 to 1/2 inch) cubes. Cut the meat into 3-4 cm (2 inch) cubes. Cut the onions into medium-sized cubes. Cut the leeks up length wise to open them up. Cut them to a length of 5 cm (2 inches) and clean them well to remove any sand. Peel the carrots and cut into approximately 5 cm long pieces. Fry the bacon slightly crispy. Add a little oil and butter to the pan if necessary. Turn the pieces of meat in flour and fry them in fat. Only a few at a time. If there is liquid in the pan, it is not hot enough or there is too much meat. If the pan runs dry you should just add more butter/oil. They should be well browned on every side. This is what makes most of the flavour. Set each batch aside as they are finished. Fry the vegetables golden in butter/oil. 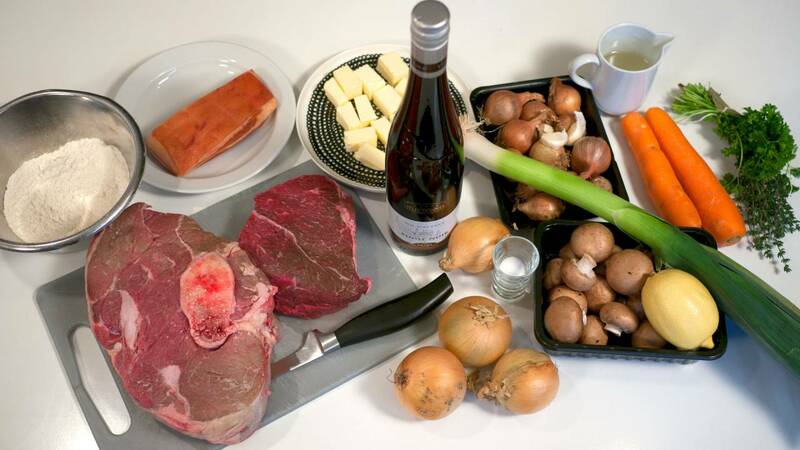 Pour the wine into the pan with the vegetables, but save approximately 1 dl (½ cup) to glaze the onions later. Boil the wine for a few minutes so the alcohol evaporates. Put bacon and meat on top of the vegetabeles and wine. Clean the mushrooms. Cut them into quarters or halves, so you get roughly equal sized pieces. Fry until golden on your frying pan in the oil/butter. Season with salt, pepper and a little lemon or vinegar. Clean them and remove the peel. Fry them all in a little oil/butter. With 1 teaspoon sugar. Add the last of the red wine and let it boil along with the onions. Fry until the onions are translucent and golden. Add a splash of water if the wine boils away before they are finished. Add the onion and mushrooms to the meat. Cook them just until they are hot. 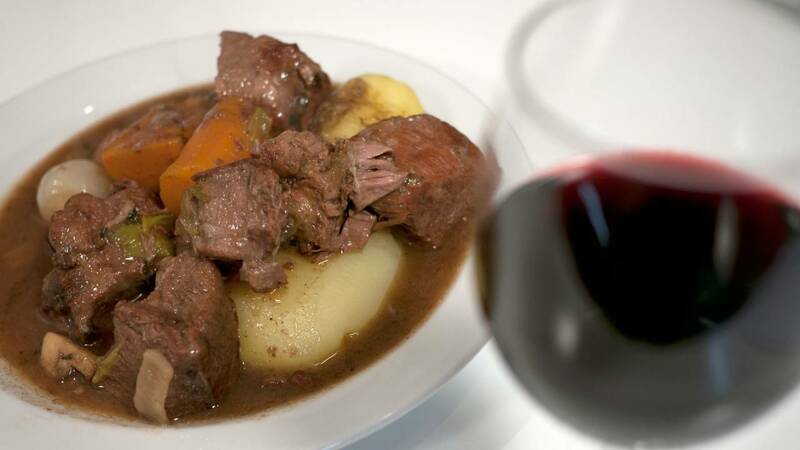 The funny thing with this recipe is that it seems like a "simple stew", but actually it is using a lot of different super-classic French principles to get it right. Onion, carrot and leeks are often basic flavors in soups and stews. Celery instead of leeks would have been more common. But not in this recipe. Basically, the dish is a simply braise. It is browned meat with flour and vegetables to give it some flavor. Then you just simmer it for some hours to make it tender. The browned flour thickener the sauce a bit, so it is very thin. But it should not be to thick. It has to be somewhat runny for the classic version. Some of the hardy vegetables are boiled along with the meat so you extract all the flavor. The last vegetables you just warm up just so they keep a bit of their bite. This is also a classic technique. However, it does not need to be a burgundy wine. I used a medium-priced wine from Alsace made of the Pinot Noir grape, which is the same as the one in burgundy. But I don't call it "Boef Alsace" because of that. Glazing vegetables like onions and carrots is also a classic technique. You can actually serve them separately if you want, for many dishes. The same goes for the mushrooms. You can make exactly the same recipe with different types of meat. With a soup rooster or thighs, you end up having "coq au vin", which is basically the same dish. Course pieces of pork or leg of lamb lamb gives an excellent result too.